It is a quarterly journal focusing on thought-provoking case studies covering different aspects of management. It is a useful reference for all executives, managers, practitioners, faculty members and students. 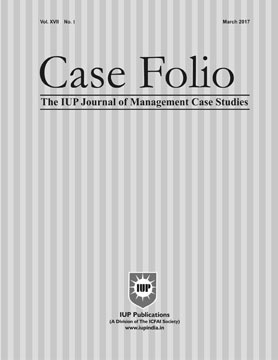 A quarterly refereed journal focusing on thought-provoking case studies covering different aspects of management. Selected teaching cases that faculty members and trainers around the world will love to take into their classrooms. The case discusses the data breach scandal involving the worldâ€™s largest social media network, Facebook, its impact on the company, and the challenges facing the social media giant. Facebook was a popular social media company with about 2.19 billion monthly active users as of the first quarter of 2018. However, the companyâ€™s continuous growth was marred by security concerns. In March 2018, Facebook was caught in a major data breach scandal in which a political consulting firmâ€”Cambridge Analyticaâ€”pulled out the personal data of more than 87 million Facebook users without their consent. The data was allegedly used in favor of the US Presidential candidate, Donald Trump, during the 2016 elections. Further, it was found that the data was also misused to influence the Brexit referendum results in favor of the Vote Leave campaign. The tech giantâ€™s reaction to the scandal was reportedly clumsy, defensive, and confused. The scandal put Facebook in a situation where it was left facing the ire of millions of Facebook users, lawmakers, and advertisers. Though the company took several initiatives to prevent such data leaks in future, it remained to be seen whether it could fix its reputation. Facebook founder and CEO Mark Zuckerberg apologized for the â€˜major breach of trustâ€™ but was that enough to reassure users? This case features the growth and evolution of eYeka, one of the leading crowdsourcing platforms for brands, over its first 10 years; looks at the three actors of crowdsourcing contests from their respective perspectives: the brands, the creators community and eYeka; and focuses on how eYeka manages its community with its platform, and how it collects, selects and leverages the ideas from its creators and works with the brands, integrating their ideas towards execution. Can Barry Callebaut Attract Sustainable Investment with Its â€˜Forever Chocolateâ€™ Strategy? Barry Callebaut, a Zurich-based chocolate and cocoa manufacturer, was the worldâ€™s leading manufacturer of high-quality chocolate and cocoa products. It was one of the first companies to realize that it had to do something about the poor conditions on cocoa farms. In its â€˜Forever Chocolateâ€™ plan for 2025, Callebaut committed to scale up its own as well as the industry initiatives to raise industry standards through its four bold targets in the chocolate supply chain. In 2017, the Swiss chocolate giant entered into an innovative revolving credit facility agreement with a syndicate of 13 banks with ING as the sustainability coordinator. As part of this, interest rate was linked to the companyâ€™s year-on-year sustainability performance improvement. Callebaut was confident that it could reach its sustainability goals, working with all the stakeholders in the cocoa supply chain, by translating its sustainability targets into a clear set of key performance indicators, and by monitoring and reporting on the progress on an annual basis. However, it was not easy for the company to drive growth on the sustainability front as it faced difficulties in managing consistency in its sustainable growth over the years. Industry observers were skeptical about Callebautâ€™s long-term sustainability goals and questioned whether these could help generate fund flow to the company. This case gives students an opportunity to analyze the potential impact of sustainability investment on the companyâ€™s strategy and performance and helps them to discuss the possibilities of further investment with the company to achieve its cocoa sustainability goals. â€˜First Sales Callâ€™ â€“ Can Tobby Crack It? This case is about the uncalled for mistakes made by a new recruit, Tobby, during his first sales call. The case begins with a brief about the company Atvlisâ€”its business area, location, products and financial performance. Thereafter, Tobby, a recent management graduate, is introduced. The case then describes the eventâ€”â€˜the first sales callâ€™; the incidents that occurred and the goof-ups Tobby made. Atvlis has been hoping to open an account with this client for a while. The case helps students to learn the various aspects of the selling process: making an appointment, developing rapport, delivering presentation, answering queries and gaining assurance. Besides, it also brings to light a rather unprofessional tacticâ€”of lying about the delivery time to bag the order.